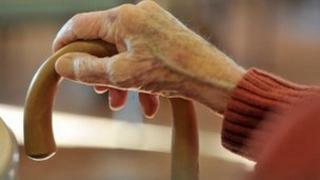 The £72,000 cap on elderly care costs in England, due to be introduced in 2016, will benefit one in eight people, the government has said. The revelation came as the government set out details about how it will work. It confirmed there would be a deferred payment scheme under which the local council would pay care fees and claim them back from the estate after death. Labour said the details would not help elderly and disabled people struggling to get the support they needed now. Ministers say the cap on costs is a solution to the elderly care crisis, but the level at which the cap is being set is nearly twice what was recommended once inflation has been taken into account, meaning the numbers benefiting will be restricted. The modelling provided by the government as it launched a consultation on the plans showed it was likely to be four years after the implementation of the changes until the first significant groups of those aged 65 and over would start to hit the cap. And because people tend not to live for very long once they have reached the level of need that takes them over the cap, the actual numbers benefiting will be in the tens of thousands at any one time. Care Minister Norman Lamb said the cap was never going to be the "panacea" for the problems facing the system. But he said while the cover was limited it should help provide reassurance across society. As well as helping elderly people financially, it had been designed to encourage everyone to plan better for old age and persuade the insurance industry to develop more products to cover care costs. "No-one wants to face an unknown future," Mr Lamb said. "This overhaul of the way care is paid for gives people the certainty and peace of mind we all deserve." Michelle Mitchell, of Age UK, said: "It is crucial that the public understands what costs are included under the cap and what impact the proposals will have. "With a cap set at £72,000, it is clear that only a relatively small percentage of older people will receive financial support as a result - namely those who have the greatest care needs for a considerable amount of time." As part of the announcement, the government also unveiled the amount individuals are expected to contribute towards their "hotel costs" in care homes. A figure of £12,000, which will not count as spending towards the cap, has been put forward to pay for things such as the accommodation, food and bills. Councils will also be asked to give people with care needs an annual "care account" so they can see how much they have paid towards the cap. The aim of the deferred payments scheme is to stop people having to sell their homes to pay for care - currently about 40,000 a year do so. The consultation on the details of the scheme will run until October 25. Jamie Reed, shadow health minister, said instead of helping those in need of support now, "ministers are offering false reassurances that older people won't have to pay more than £72,000 or sell their homes to pay for the costs of care. "More than £1.8bn has been cut from local council budgets for older people's social care since this government came to power. David Cameron has unleashed a funding crisis in social care. We must see immediate action to improve the care system."